Morning’s trading on the FX market is bringing widespread weakness of the NZ dollar being traded more than 0.4% lower against the buck. This is a response to the employment report we got yesterday evening (European time) which was not excellent to say the least. However, a caveat needs to be applied that the weaker numbers for the last quarter of 2018 came after the splendid release we got for the third quarter. 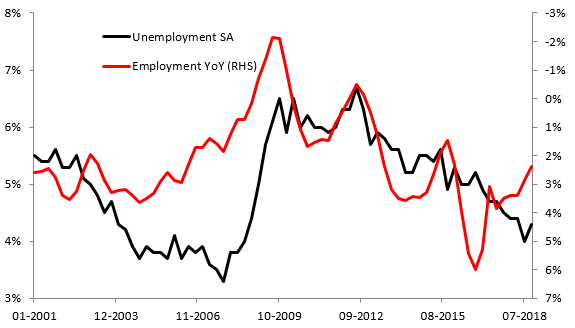 Therefore, given the fact that the labour market in New Zealand is relatively small, a comeback to a bit more “normal” levels could have been anticipated. First of all, the unemployment rate jumped to 4.3% from 4% (revised up from 3.9%) and missed the median estimate of 4.1%. A disappointment was seen also on the employment front as it grew barely 0.1% QoQ whilst the consensus had pointed to a 0.3% QoQ increase. The previous quarter, however, saw a 1% QoQ jump (revised down from 1.1%). In annual terms employment grew 2.3% falling short of the consensus of a 2.6% increase. Furthermore, despite a noticeable jump in the unemployment rate, the labour force participation rate decreased to 70.9% from 71% (revised down from 71.1%) signalling that at the end of the fourth quarter there were relatively more people without a job even as the overall number of active people in the labour market fell. That is not a reassuring sign, albeit again this could be more like a comeback to “normal” levels after we got the astonishing numbers for the third quarter. Finally the data coming from the NZ labour market tends to be much more volatile compared to those for example from the US - this stems from the magnitude of the markets and the economies as well. On the wage front, average hourly earnings rose 1% QoQ beating the median estimate of a 0.8% QoQ rise. Private wages including overtime jumped 0.5% QoQ, the same number was seen in case of wages excluding overtime - both numbers were slightly weaker than expected though. It needs to be said that “there were some adjustments to the December quarter data, which means that some series should be treated with caution”, the NZ statistics bureau said. What could be an impact on monetary policy? Taking into account that the RBNZ has previously stated that the current level of slack is more or less consistent with employment around its maximum sustainable this report should not change the bank’s reaction function. The market-based probability shows almost 40% chance to see a rate cut by the end of the first half of 2019. According to the Federal Reserve Jerome Powell the US economy is in a good place. He also added that sluggish productivity and a widening wealth gap were the biggest challenges facing the US over the next decade. Note that his comments regarding a “good shape” of the US economy seem to be at odds with a stance presented by his predecessor Janet Yellen who said earlier this week that the next would might be up or down, and a cut was possible if the American economy weakened. Some remarks were also delivered by Fed’s Quarles who said that he the bank had better tools than monetary policy to address financial stability concerns. Quarles also stressed that liquidity of banks was much stronger today than before the financial crisis, however, he admitted that some asset valuations were stretched. The US dollar did not respond to these comments and it keeps trading in the vicinity of the flat line this morning.